Min. quantity is 100. Quantity variation +/- 5% is possible & billable. Available with one side or 2 side imprint. It has a compact square design with a die cast metal case. 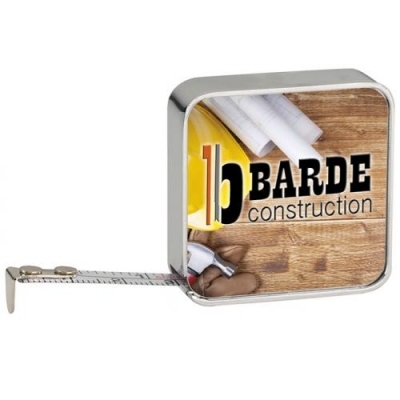 Metric/Inch Scale Only, with 6' x 3/8" blade. Price includes a full-color imprint, 1 side. Imprint area: 1- 5/16"w x 1- 5/16" h on vinyl panel. Packaging: Black Velour Pouch. Weight: 20 lbs. per 147 pieces. Option: Second side imprint Setup $50 plus $0.50 per piece. Setup charge for full-color imprint: $50 per side.